One of the topics for my procreation and parenthood class this past semester was lying to children: is it less bad than lying to adults? One of my students told of a currently popular type of lie, illustrated by the picture above. Actually, there are two lies here, one addressed to adults, and one to children. 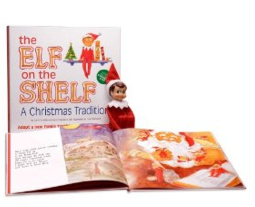 The lie to children involves the elf figurine, who is supposed to be set on a shelf, and, according to the storybook, spies on the kids and reports their misbehavior to Santa. The lie to the buyer is that "The Elf on the Shelf" is a Christmas tradition. It can't be all that traditional, considering that the book was written in 2005! I like to indulge in just a touch of curmudgeonly over-thinking on Christmas Day, so -- hmm -- is there anything wrong with the elf on the shelf? My class read a very interesting and well-written article on lying to kids by philosopher Amy Kind in which she says it's not as bad because (in so many words) a lie to an adult short-circuits the adult's decision-making powers, whereas a child may not have had any decision-making powers to short-circuit. You could use this line of thought to defend "The Elf on the Shelf": a child (you might say) loses nothing from her parents putting the elf on the shelf, assuming she'd just go ahead and do naughty things in the absence of the elf, not decide whether or not to do them. I admit that I don't mind other Christmasy deceptions. For example, I've always quite enjoyed my in-laws' tradition of setting out mince pies and milk for Santa Claus on Christmas Eve, not to mention carrots for the reindeer. Many a time, a letter from Santa has even shown up in the morning, with profuse thanks for the goodies, and I may (MAY) have had something to do with that. All that's OK, imho, because it's done with a twinkle in everyone's eye. This is all obviously make-believe-ish, and if the kids don't see that, it's because they choose not to. By contrast, if you're really serious about elvish surveillance of your children, then you'll have to get that twinkle out of your eye. Your child will be unable to avoid the deception. Which seems bad, but if there's no loss of decision-making power, how so? Why is it worse, for example to put the all-seeing elf on the shelf, to prevent candy cane theievery, as opposed to simply putting the candy canes higher up on the tree, so you're child can't reach them? The article by Kind surveys lots of possible views on what's so bad about lying, and whether lying to children is more benign. I'm still scratching my head...while sipping sherry and looking forward to Christmas dinner. Hope your holiday, whatever you celebrate, is going nicely. But as parents aren't we supposed to be helping develop the reasoning capabilities in our children? And wouldn't feeding them deceptions about reality make it more difficult for them to reason? Or worse, more prone to accept other fantastic stories like religions? I've always taken the stance that lying to children about Santa and such, may not be a huge wrong, but the more I think about it, I can't help but wonder if it really is more wrong than I believe.